One of summer's traditions is to go to camp. My two oldest kids have been going to camp for a few years now, but this year my youngest was old enough to go. 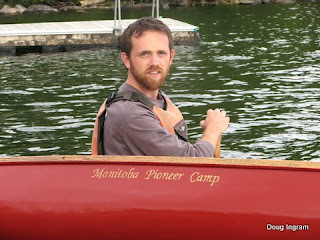 Manitoba Pioneer Camp, (http://www.manitobapioneercamp.ca/) is the camp that we have associations with. Given that the kids were away, that left my wife and I with 12 days essentially to ourselves. 21 years of marriage, and we finally have 12 days! What to do, what to do? Well, we decided to spend a few days at camp too. Instead of working there, we decided to have a bit of vacation for ourselves. 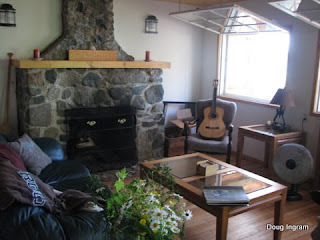 MPC has set up on of the cabins as a retreat cabin, and is available for a nominal rent. 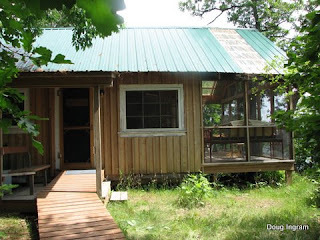 Coincidentally, for canoe enthusiasts, this cabin has long been known as the "Stuga", and is the cabin where Bill and Joyce Mason stayed right after there wedding. It was more rustic in those days, it is fixed up quite nice for its present role as "Gem's Retreat". I have an arrangement with MPC that I will take some of their wood canoes, the basket cases that no one else can fix, restore them and pay for my kids to attend camp in trade. Its a win-win situation. A rare photo of me paddling. Rare because I'm usually the one working the camera. I have started naming the canoes for camp. This is to aid in the oral history that accompanies each of these old canoes. 18 wood and canvas canoes remain at camp, and each has lots of history. 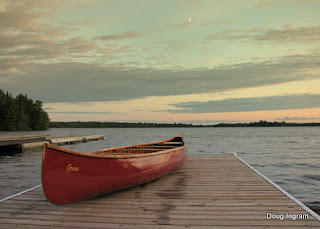 To most of the campers, they all look the same, just old wood canoes, specially if they are all painted the same colour, and they are: red. So, by naming them, they each are identified individually. this canoe is called "Grace". I also put the camp name on the side. 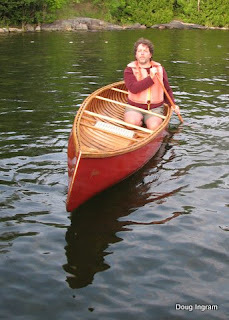 Here is Chris Milne, an MPC staffer and wood canoe advocate, taking Grace for a launching paddle one evening. Posted by Doug Ingram at 10:46 a.m.